Josh Billings? Josh Weathersby? Cal Stewart? Ring Lardner? Anonymous? Some reference works credit Josh Billings, but none of these works present a solid citation. Would you please attempt to uncover the truth about the provenance of this adage? Quote Investigator: Some books have suggested that the maxim appeared in a poem called “The Kicker” that was supposedly composed by Josh Billings circa 1870. 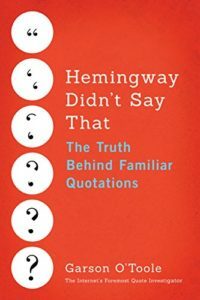 But the careful and scholarly reference “The Yale Book of Quotations” remarked that the existence of “The Kicker” by Billings has never been verified. 1 Indeed, QI believes that the attribution to Billings is unsupported. The word “kickin” was a slang term that referred to complaining or causing a disturbance..